Betties N Brimstone: New York, New York! Hello All! 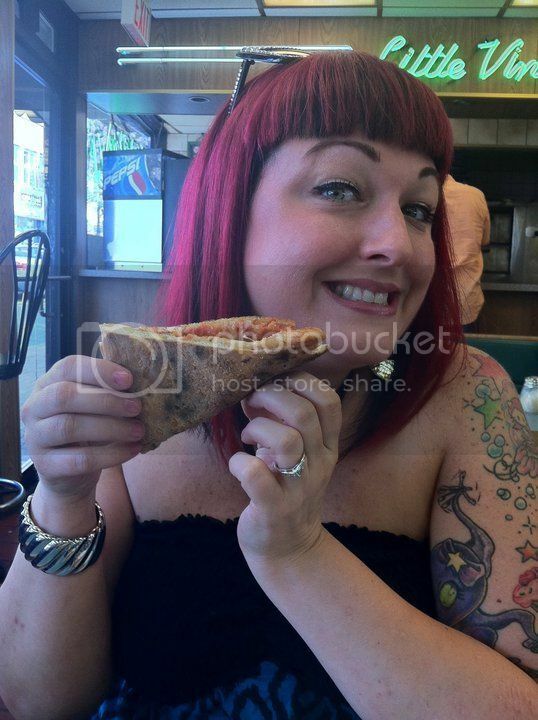 This is a picture of me a couple of years ago eating a slice of pizza from my favorite place on Long Island. Why this picture? Because I am in NY right now. Gunnar and I have been here since the 25th of July. I flew in early to surprise an awesome friend for her baby shower. A cool idea but I am missing Shane as by the time I get back to Illinois we will have been separated for 18 days, we have NEVER been apart for that long. I bet he is not missing my nagging but is missing my cooking and Gunnar. The main reason for this trip aside from family fun was to complete some Wedding business and celebrate my Bridal shower (which is today!!!) and my Bachelortte party which is tomorrow. I also plan on eating all the seafood, bagels and NY pizza while still losing weight! HA! I will let you know how that goes next week.